Raduane Fadel, a wheelchair attendant at Logan Airport, will see his pay rise to $10 an hour from $8 an hour as the first phase of the state minimum wage hike goes into effect. More states will increase their minimum wage in 2015 than in any other year in history following a national movement of low-wage workers, advocates, unions, and political leaders that raised alarms about the widening gap between rich and poor in the United States. The minimum wage will rise this week in 20 states, including Massachusetts, where starting Thursday the rate jumps to $9 an hour, from $8. Four other states will increase their minimum wage rates later this year. By 2017, the minimum pay in Massachusetts will rise to $11 an hour — the highest in the nation. The wage raises provide an immediate, tangible effect for more than 3.1 million earners at the bottom of the income scale. In Massachusetts, an estimated 280,000 people earning the minimum wage — or about 9 percent of the state’s workforce — will get a raise this year. Rita Diaz will get a pay increase at both of her $8-an-hour jobs, at Popeyes in Roslindale and the clothing store CW Price in Dorchester. The 26-year-old will still have to live with her mother in Dorchester, but she said the additional earnings might allow her to get a bus pass more often instead of walking. She also hopes she can give her mother more money for bills — and maybe even have enough left over to get her hair done once in a while. “It’s not a lot of difference, but it’s better than $8,” she said. For the first time, a majority of states will have a minimum wage above the federal rate, currently $7.25 an hour. Raising wages became a major issue, and a proxy for the broader debate on income inequality in a democratic society, after President Obama early last year required federal contractors to pay employees at least $10.10 an hour and called on Congress to raise the national minimum wage. Around the country, low-wage workers, from fast-food employees to retail staff to home health aides, took to picket lines to demand $15 an hour — which worker advocates consider a living wage, or the minimum needed for a full-time worker to afford basic necessities like food, housing, and clothing. They got results. Seattle and San Francisco approved $15-an-hour minimum wages, which will be implemented over the next few years, and major retailers such as Walmart, Ikea, and the Gap said they would raise the wages of their lowest-paid workers. In Massachusetts, the Legislature approved the higher minimum wage in June as a grass-roots campaign to put the issue on the November ballot gained momentum. Still, proponents of the increase say that even with the bump to $9 an hour, the state minimum wage, adjusted for inflation, remains below that of 1968, which would be about $10.86 in today’s dollars, according to the Massachusetts Budget and Policy Center, a left-leaning think tank in Boston. But many employers worry that the forced raises will make it harder to hire new workers and stay profitable, especially as other costs rise. Massachusetts is already an expensive place to do business, with some of the highest labor and energy costs in the nation. Most retailers already are required to pay employees time-and-a-half on Sundays, and a new law mandating paid sick time kicks in next summer, which small businesses say will further increase their costs. Massachusetts is also one of 17 states that don’t have a lower wage for teenagers or those in training. The roller rink used to pride itself on hiring teenagers, but Conway said she can’t justify paying a 14-year-old $9 an hour when she could hire an adult with more experience for the same rate. At Winthrop Marketplace, owner Marc Wallerce estimates the payroll for the 50-plus employees at his Winthrop grocery store will increase by up to $13,000 this year, an amount that will go up when the minimum wage rises again in 2016 and 2017. Not only does he have to give raises to workers going to $9 an hour, he also must do the same for the rest of his hourly workers to keep them at rates above less experienced staff. 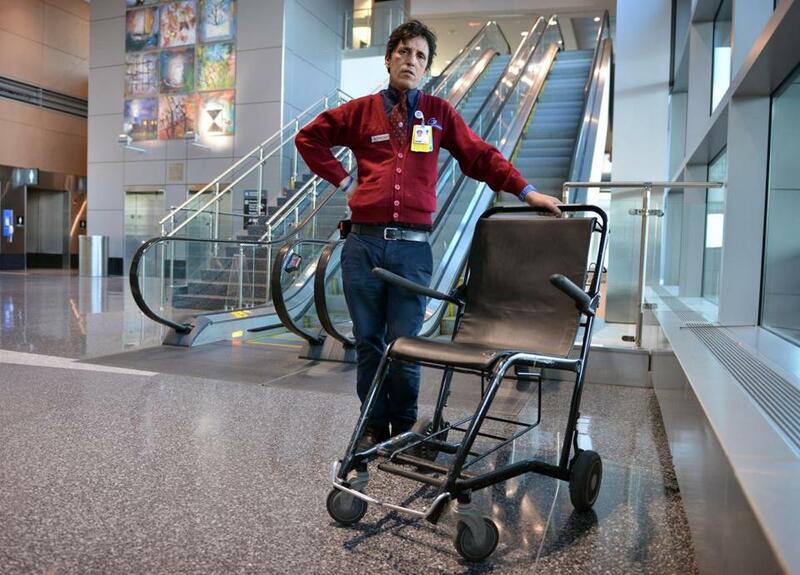 Radouane Fadel, a wheelchair attendant at Logan International Airport, has struggled to get by on $8 an hour. Fadel, 47, shares a room with his brother in an apartment in East Boston and rarely has money left after he pays his monthly bills and sends money to his wife in Morocco. Airport workers are pursuing a wage of $15 an hour from the contractors that employ them, and the Massachusetts Port Authority recently voted to enact the state minimum wage increase a year ahead of schedule, requiring companies to pay workers at least $10 an hour as of Thursday and $11 next year. Fadel said the $2 an hour raise wouldn’t change his life for the better. And yet he said it’s made him think about putting aside money to have root canals that could save three of his teeth.